Four years ago, the introduction of pension freedoms turned the retirement savings market upside down. An overview of the tax rules saw the ability to withdraw some or all of an individual’s pension savings at any time from age 55. This new facility known as “flexi-access drawdown” (FAD) also allows any remaining pension funds to pass to a nominated beneficiary on death, usually free of inheritance tax. The upshot of pension freedoms has been that around 100,000 final salary scheme members are trading in their guaranteed income for a cash lump sum each year, whether it’s the right choice for them or not, according to the Financial Conduct Authority (FCA). And the average final salary transfer exceeds £250,000. Why are such a high number of savers opting for final salary transfers? Persuasion might play a role. The change in legislation opened the floodgates to numerous advisers, eager to recommend defined benefit (DB) pension transfers. In October 2017, the FCA published the results to a study that outlined that as many as 50% of advisers were incorrectly recommending member transfer. New rules were introduced in the Autumn 2018 Budget, primarily aimed at preventing a mis-selling scandal. And it’s confusing for people approaching retirement. Many individuals are cashing in on their final salary pension benefits as they prefer (or think they need) the drawdown flexibility, together with the potentially better death benefits. But most individuals are enticed by the perception of a “no-brainer” transfer value and the chance in a lifetime to take advantage of it while they can. Are final salary transfers the right move? Final salary transfers are nothing new and in the right circumstances they can be beneficial for individuals and the right decision for them. Most good financial advisers, however, will simply say not to transfer, or only recommend it if it makes complete sense. Unfortunately, others – as outlined above – are quick to say yes and without good reason for the saver. There is a process to follow and a lot of number crunching to determine whether it is in the individual’s best interests and importantly that they won’t be worse off by giving up the guaranteed income. This is why seeking impartial advice from an adviser who will look at your individual circumstances and make the best call for you is paramount. We often speak to individuals wrestling with whether to transfer a defined benefits pension and we always advise speaking to a professional financial planner who will use techniques like cashflow modelling to help you see the bigger picture. Never take such monumental decisions without thorough investigation first. Take Mike, a 64-year-old business owner, who was recently offered a transfer value just shy of £1m. After some probing it transpired that Mike had no real reason to transfer, other than having £1m in his pension pot. He did want to give his children £200,000 and felt that taking it from the transfer proceeds was a good idea. He was in very good health as was his wife, Kate. He was also quite cautious on investment risk and an inexperienced investor. He carried out his own calculations and felt that if it grew by 4% each year, this would be sufficient to meet his income needs in retirement. Mike initially met with a large advisory firm and was informed that this should be perfectly achievable by investing directly in high-yielding securities, which typically yield around 3% to 4% pa. Luckily, he came to us for a second opinion, as he had decided to shop around before making such a big decision. Is flexi-access drawdown so appealing? Mike was sold on the idea of flexi-access drawdown to take out £200,000 to give to his children. But he was not informed that with residual funds of £800,000, his required level of return would immediately increase to 5% pa. He also didn’t account for fees and charges, which probably takes the required return closer to 7% pa.
At this point the decision to transfer was no longer clear, but we carried out some cash flow planning to look at Mike’s entire situation and build a picture of his finances now and in the future. This included considering any other income he had, assets, the future sale of his business and more conservative returns. The first scenario was to “do nothing”, retaining his final salary pension, using other assets to give money to the children and retire as planned with a gross annual income requirement of around £70,000. This plan clearly showed that Mike does not need to take any risk in retirement – he doesn’t need to transfer the pension. He can comfortably meet his income needs and while it was not a high priority, he can potentially leave his sons almost £2m, in addition to the family home. The second scenario was to consider the transfer value alongside the other assets and Mike’s income needs. This also demonstrated that Mike could still retire comfortably, but he may not maximise the residual estate or generally be financially better off. While the second analysis would give Mike some comfort that he and his wife should be ok throughout retirement, there was still no major reason to transfer, as Mike could simply use his other savings to make gifts to his sons and leave a significant legacy either way. Lastly, to be on the safe side, we considered potential future market unrest and simulated periods of volatility on his finances. The outcome was that the residual funds could end up being considerably lower. The outcome was clear to Mike that he did not need to transfer his pension, or take any undue risk. The discussion with him led to the issue of his potential inheritance tax (IHT) liability and the simple use of life cover to pay the tax bill. All in all, Mike left much happier and convinced of the benefits of not transferring his pension. He was delighted he had decided to seek a second opinion. It is really important that people don’t get swayed by high transfer values or the flexibility of drawdown. It might not be right for them and they might be worse off as a result. And they need to bear in mind factors such as the option of retaining the final salary pension, charges and fees if they are transferring and periods of market volatility. Ultimately, it’s vital they seek advice to help them come to the conclusion that’s right for them. Why do I need to transfer my final salary pension and lose the guaranteed income? Have I considered all my other savings, pensions and investments to provide the flexibility or the lump sum that I need? Should I get a second opinion if I have been advised to give up my guaranteed income? Can I afford to live without the income I am giving up? Can I afford to risk losing some or all of the transfer value if I decide to transfer? 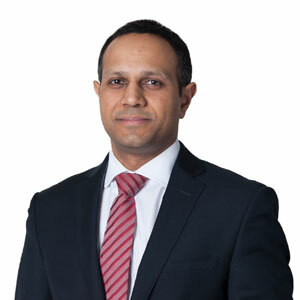 Nero Patel is Wealth Planning Director at Canaccord Genuity Wealth Management with over 16 years’ industry experience, he provides strategic financial planning services to a range of private clients, in addition to professional introducers both personally and to their clients. Achieving a range of retirement planning goals is eminently achievable with the right professional advice, as this investor found. Pension planning can be a real balancing act and you need really stay on top of progress towards your saving goals. These calculators will help you know where you stand.